The “Why wasn’t there something like this back in the day?” department is delighted to learn that this year sees the thirteenth annual running of a competition by the University of Southampton’s mathematics department, entitled the National Cipher Challenge. It is aimed at – and prizes may only be won by – those aged 18 or under in school-level education within the UK and associated Crown Dependencies. Doubtless competition alumni sometimes participate hors concours, ineligible for the goodies. A ship taken by pirates off the port of Salalah is found drifting with a cabin full of communications equipment and attack hardened computers. Encrypted Files on the servers reveal that the ship was used as the HQ of the Flag Day Associates, a world-wide hacking group responsible for chaos in the international community. Could this be the break you need to bring them to justice? The competition is held over eight rounds from October to December. The pace is largely one round per week, though it slows down midway as different schools take half-term at different points. In each round, a new encryption technique is introduced. They start off very familiar – just a simple Caesar shift in this year’s first round – but get to some pretty meaty stuff by round eight. After the introduction, along with a considerable quantity of plaintext to advance the story, two challenges are presented using that challenge’s technique. The first (“A”) challenge is meant to be the easier of the two, may be heavily clued by the developing story, and is marked on accuracy only; the second (“B”) challenge – this year, representing files on the servers – may be a little more difficult, or require a little additional lateral thinking, and is marked not only on accuracy but also on speed. Sensibly, the granularity of the scoring means that you don’t have to be able to start the second that the puzzles are released and solve it within minutes and seconds in order to stand a chance. The puzzle release might clash with double chemistry, after all. As well as spot prizes along the way, the main prizes are awarded on results from the “B” challenges – and, even then, the first two rounds are used as unscored warm-ups, so it’s still not too late to register and be able to compete to win. The scores from the final six “B” challenges are combined to determine the overall winners. The top individual solver wins a grand in the hand; the top team similarly share a thou between them. (Second prize in each contest is £750, also well worth winning.) Many thanks to Trinity College Cambridge, GCHQ, IBM and Winton Capital Management for their sponsorship of the event. 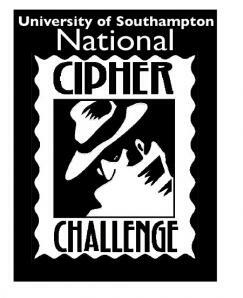 Now if you’re already a National Cipher Challenge participant and love it, you might have found your way here and be thinking “That was cool. What else might I enjoy?” The answer: more than you might think. There are a number of online puzzle hunts where decryption is often a key technique, and no better place to start than the free Order of the Octothorpe. No prizes, just for fun; if you can make a decent fist of the NCC then # will probably not detain you for more than, say, a day or two during the holidays, but you’ll have some laughs (and learn some new things) along the way. There are events in person as well – though, at time of publishing, sadly not yet really flourishing outside London – of which the annual springtime highlight is probably the global DASH event. While you have to be old enough to visit a pub in order to attend the monthly Puzzled Pint event (and some of the puzzles contain, shall we say, cultural references that skew towards those of drinking age, as well as occasional Americana where it helps to have spent decades watching classic TV shows from across the pond) there’s nothing stopping the enthusiastic but young from getting a Pint habit early. Lastly, if you enjoy the NCC but also enjoy other sorts of puzzles – think sudoku, then think of kakuro and the other types of logic puzzles that tend to be printed near the sudoku within the better newspapers – then there are hundreds of different sorts of other puzzles that you may enjoy, where you may find example puzzles online to solve at your leisure. One good place to start is janko.at, and enjoy picking through the German language as part of the puzzle. There are plenty of time-limited online contests that you may enjoy from time to time – see the calendar – leading up to the annual UK Puzzle Championship. (Similarly, if you’re a sudoku specialist, the UK has a championship for that too.) If you’re really good, the height to aspire to after years of practice is your national team for the World Puzzle Championship. Sweet dreams!